Six-time NHRA champion Kenny Bernstein completed the required runs Thursday at Firebird Intl Raceway to obtain his Funny Car license. NHRA rules state that a competitor must make two runs of 250 mph or faster and two runs of 5.50 seconds or quicker. On Jan. 29, Bernstein clocked 5.312 seconds at 209.85 mph in his Monster Energy/Lucas Oil Funny Car and made a second run at 5.146, 271.13. After waiting for rain showers to subside for the last two days, Bernstein today fulfilled the final speed requisite with a run of 5.94 seconds at 296.89 mph. Bernsteins license was signed by John Force and Gary Scelzi, who with Bernstein account for 24 NHRA world championships. (Force, 14; Scelzi, four; Bernstein, six). “Fulfilling the license requirements is a huge relief,” said Bernstein. “Because were a new team coaxing a new race car down the track coupled with two days of rain delay, I was beginning to get a little nervous. 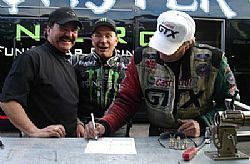 NHRAs two most recent Funny Car champs, 2005 king Gary Scelzi, left, and reigning champ John Force signed Bernsteins license papers. “I want to especially thank John Force, who is a great champion with a great heart. John watched us struggle with tire shake over the weekend and was so gracious to send Austin Coil, John Medlen, and Bernie Fedderly, a great part of his brain trust, over to lend us assistance. Without their help and that of Gary Scelzi, I dont know if we would have accomplished what we have today. “Also, we want to extend a big thanks to all the drivers over the weekend who were so helpful and supportive. I am proud to be a member of the NHRA Drag Racing family and humbled by all those who came to our aid. Now our team can turn their focus to other areas to prepare for the season opener at Pomona.